All homes currently listed for sale in the zip code 90004 as of 04/25/2019 are shown below. You can change the search criteria at any time by pressing the 'Change Search' button below. "Rarely does a property of this elegance, character, & scale come to market ideally situated on one of the most desirable streets in Hancock Park. This stunning Mediterranean Villa sits on a sprawling corner lot & features unsurpassed frontage, surrounded by lush gardens and mature landscaping providing the utmost privacy. You are greeted through the grand foyer with a sweeping staircase, wood inlay floors, custom crown molding & french doors.This expansive 6bed 8bath home boasts over 8500SF of living space w/ designer details i.e., custom millwork, ornate crown molding, imported fixtures, & French doors opening up to balconies, verandas, and entertaining areas. The outdoors surrounds you in this regal retreat featuring a wraparound grassy yard, large swimmers pool, various patios, outdoor dining & adjacent gym/cabana room. This is a once in a lifetime opportunity to own a grand estate in prime Hancock Park once owned by Phil Rosenthal one of the most prolific creators in TV history." "THE RIMPAU ESTATE. Hancock Park's Tour-de-Force of Refined Elegance & Classic Architecture. Built by famed architect Paul Williams & recently remodeled by noted designer Tim Morrison, this extraordinary French Regency is hidden from the street & is sited adj to the Wilshire CC affording serene golf course vistas. Only the finest imported materials were used in the Owner's meticulous renovation. Grand 2-stry entry staircase leads downstairs to gorgeous 12ft high entertainment rms graced by exquisite crown moldings, mantled FPs, & beveled glass French drs that all open to expansive terrace which is perfect for entertaining. Remarkable center island Kitchen has a Le Cornue range. Upstairs are 3 bdrms + mds, incl the lavish Master en-suite, which features adj study, 2FPs, luxurious Cartier marble bath complete w/ steam shower& lrg walk-in closet. Formal park-style Rose Gardens, landscaped pathways, & a secluded pool/spa area w/ a spacious cabana complete this Outstanding Estate offering." "Magnificent Meticulous English Golf Course Estate by Architect L.G. Scherer. Former owner Francis Ford Coppola. 6 Bd 7 Bth w/ original character/features. Dramatic 2 stry entry w/ split staircase. Step down living room w/12 ft coiffered stenciled ceiling. Stained leaded windows thruout. Formal paneled dining room w/ stenciled ceiling. Study w/ fireplace + mail room. Gourmet center isle kitchen w/ breakfast bar, Viking appliances, large family room. Maids suiten+ 1.5 additional baths down. Private master suite w/ firplace, terrace w/ golf course view, adjacent office, double bathrooms + multiple closets. 3 additional beds (2 w/ private terraces) + 2 baths upstairs. Park-like grassy yard w/ large pool, raised spa, outdoor fireplace, built in barbecue on amazing manicured grounds. Btfl driveway w/ remote access gate + carport + 2 car garage. Multi zone AC, Sonos, updated systems, 3 gas fireplaces. Small recording studio formerly used by Ariana Grande in basement. 3rd St. School." "Set back from the street, on a prime tree-lined block, this spectacular restoration of a Hancock Park classic is available for the first time. Enjoyed by the same family for over 70 years, and now lovingly restored by its current owner, this 5 bedroom 6.5 bath Paul Williams-designed Mediterranean is not to be missed! The home features 5 en-suite bedrooms including a spacious Master Suite with dual closets and baths, new sparkling pool, restored original steel framed windows and refinished original oak hardwood floors. Careful consideration was taken to preserve original details while delivering plenty of modern amenities such as iPad-controlled Lutron + NEST system, multi-zoned Sonos system, camera security system. Third Street School. There is great warmth and depth throughout. This is the house you have been waiting for!" "Hancock Park Mediterranean with four bedrooms and two bathrooms upstairs, swimming pool, and guesthouse. Center hall plans opens to elegant step down living room on one side and generous dining room on the other. Spacious center island kitchen with granite countertops, brand new double dishwashers, double sinks, and double ovens opens to breakfast room with views of the backyard and pool. Sunroom, family room, powder rom, and laundry downstairs. Four beds + tandem room and two baths upstairs. Generous closet space. Central AC up and down. Hardwood floors. Alarmed for security. Guesthouse with kitchenette, living room, bedroom, bath with shower. Third Street School District." "Location! Location! Location! Come see this sophisticated Mediterranean 4 bedroom, 3.5 bath close to Larchmont Village. The columned entry and the lush garden gives this home great curb appeal. Inside stunning architectural details include cove ceilings, arched windows and arched transitions between rooms. French doors open to a lania patio and tropical gardens. Upstairs is the master suite with a fireplace and a tiled balcony! Downstairs has 3 generous bedrooms and baths." "Offered for sale for the first time, this Larchmont Village contemporary by architect Zoltan Pali embodies a modernist aesthetic of elegant simplicity and highly functional interior and exterior spaces. Built on the lot's long axis, the home's main living rooms open onto an enclosed courtyard with lawn, sunken patios, and garden areas for easy indoor-outdoor living and entertaining. On the ground floor are family/media room, double-island kitchen with dining area, and double-height living room. On the upper level, the two bedrooms have large windows, beautiful cabinetry, and tree-top views. Gated courtyard entry and side yard are tastefully landscaped, and include fireplace and fire pit, dining and seating areas, and raised beds. Reminiscent of the mid-century Case Study homes, this highly functional, beautifully constructed, and well-maintained home is a contemporary classic conveniently located near studios and the many restaurants and boutiques on Larchmont Boulevard." "Rare magical + emotional Hancock Park Spanish w/ 4 beds, 3.5 baths, secret garden w/ pool, & 2 car garage! Down-to-the-studs 2013 remodel incl all new plumbing + electrical, kitchen, bathrooms, all new floors thuout. Center hall plan w/ winding staircase to 2nd flr. Large LR w/ beams, imported stone working fireplace, doors to backyard oasis. Formal dining opens to kitchen. Large center isle kitchen w/ stone counters, Miele appliances (incl steam oven), Blue Star prof grade 6 burner range w/ griddle + 2 ovens, wine fridge + ice machine, breakfast bar, built-in desk area, breakfast room. Powder off kitchen. Large fam room w/ built-in bookcases & doors to yard has murphy bed + en-suite bath. Master suite w/ porch, designer bath w/ walk-in steam shower, large walk-in closet. 2 additional beds + 1 remodeled bath up. Garden w/ pool + spa + covered porch + whimsical playhouse. Alkaline water purification system, Sonos, Nest AC + fire alarms, wired for fast wifi. 3rd Str School District!" "RARE OPPORTUNITY! HPOZ NON-CONTRIBUTING HOME IN HANCOCK PARK. This Tudor Revival style home near Wilshire Country Club, LA Tennis Club, and Third Street school district is truly one-of-a-kind. Nestled away on a very quiet street, close proximity to Larchmont village. This 5 bedroom, 4 bath includes a beautifully updated kitchen, 2 living areas, and a roomy dining room for hosting. The natural sunlight follows you throughout the first floor, leading you up the gorgeous staircase to the second floor, where you'll find spacious bedrooms and ample closet space. The backyard boasts a partially shaded sundeck overlooking the gated pool. Detached 3 car garage offers plenty of parking. You wouldn't want to miss this opportunity!" "LOCATION! LOCATION! LOCATION! Duplex in the heart of Hancock Park, Walking distance to Larchmont Village Farmers market, Paramount Studios ." "Extraordinary places lead to extraordinary living! Private, elegant and Turn-key. Country Club Manor, where the roaring 20's of old Hollywood meets the romantic elegance of Paris and the sophistication of New York City. Built in 1926 by world-renowned Architect Leland Bryant, this French Normandy style masterpiece is regarded as the finest and well-built, most sought-after residence on the West Coast. It's known as one of the grandest and most impressive pre-war, full service buildings in all of the Los Angeles. 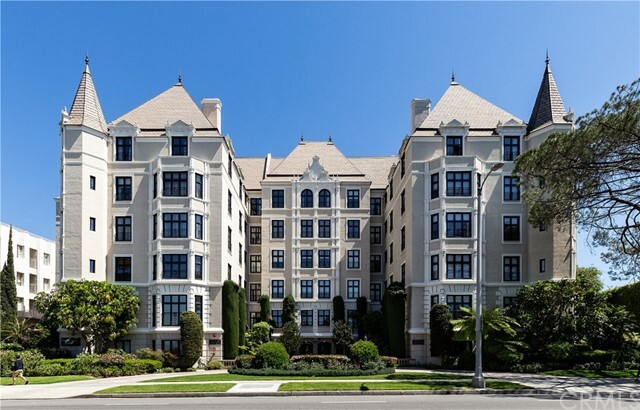 Situated in the heart of prestigious Hancock Park, Country Club Manor sits across from The Wilshire Country Club. It's just steps away to the charming Village of Larchmont & a short walk to Paramount Studios. It's central location with nearby freeway access makes it easy to enjoy all that Los Angeles has to offer. This elegant & unique corner unit boast incredible views of the Hollywood Landmark, Downtown Los Angeles, Mountain & Observatory. This awe-inspiring open floor plan w/3 bedrooms, 3 baths has you plenty of space for entertaining. Turn-key kitchen opens to the living room w/La Murrina Chandelier, Master Suite w/Bathrm & Baccarat Chandelier. Crown moldings, dark hardwood floor and lots of windows, full size audio-video music system, high 12 foot vaulted ceilings, 2 indoor parking spaces & full service concierge with valet. This home has been meticulously upgraded with the finest of materials. Too many upgrades to list. Own a piece of history. See Virtual tour." "Chic and Sophisticated Spanish Hacienda on prime tree-lined street in Hancock Park & Third Street School District! Open and light floor plan includes a warm & inviting formal living room with fireplace, dining room, chef's kitchen w/ breakfast nook & family room/den (could be used as a 5th bedroom). 4 spacious bedrooms upstairs including the hotel-like Master Suite w/ fireplace, outdoor balcony, en-suite spa bath & walk-in closet! Security/Nest and built-in Speaker System throughout. Newly landscaped front and backyard with ample play, dining, and entertainment areas including outdoor bar! Garage perfect for gym, home office, or creative space. Ideally located near shopping, restaurants, LA Tennis Club and Wilshire Country Club!" "Incredible value in Windsor Square with this fully renovated California Prairie situated on a quiet street, in the highly coveted 3rd Street elementary district. Historic home carefully restored & modernized w/quality finishes & details whilst preserving the charm of the past. Flooded w/natural light, an elegant living room, formal dining space, and an open plan family room provides functional beauty throughout w/custom chefs kitchen. This state of the art kitchen has custom cabinetry, Thermador appliances, a bar equipped w/wine fridge, and an Open concept floor plan offering La Cantina bi-fold doors creating a seamless indoor outdoor flow. Upstairs, 4 bedrooms, 2 with an en suite bathroom & private balcony. Master suite has a walk-in closet, private balcony, and a custom designed bathroom w/free standing tub. Brand-new permitted detached guest house offers endless possibilities. Landscaped backyard w/private deck is perfect for outdoor dining & entertainment. It is a must see!" "Leave the doors open and enjoy indoor-outdoor living at every turn. The open-concept floor plan fills with natural light starting from the sunroom entryway, leading through double French doors that separate the large living room and formal dining area. Just before you head out to the enclosed patio you are greeted by a galley kitchen and breakfast room with original built-in cabinetry. This 1920s home in Windsor Square features 4 bedrooms with walk-in closets, 3 bathrooms, and an office. Beautiful Craftsman details include mahogany, beveled glass, marble, crown moldings, hardwood floors and a wood-burning Batchelder fireplace. Plenty of attic space for possible expansion. The private backyard is an oasis in mid-city, with flowers, herbs, and mature trees including a tangerine, sky-reaching sycamore, 3 lemons, and more! All of this, plus nearby Larchmont Village & the sought-after 3rd Street Elementary School District, make the perfect combination to call home." "A truly remarkable property.This warm and inviting home consists of 5 bedrooms and 4 baths. Step into the marble entry way that leads to a spacious living room on one side and an elegant formal dining room on the other side. This beauty contains a sun room ,huge attic, updated kitchen and baths, Batchelder fireplace, hardwood floors, beautiful crown moldings, skylights , many french doors throughout . Relax in the lovely back yard and escape from the hustle and bustle of the city swimming in your own private pool. Spacious guest house with high ceilings and an art deco bathroom and separate shower and sauna. Fabulous opportunity to live close to trendy Larchmont village ." "The confluence of exceptional design and understated luxury; these two expansive, vertical residences were designed and constructed under the supervision of renown architect Jack Moses. Each residence is approximately 4,217 SF with 4 Bedrooms and 4.5 Bathrooms. Extraordinary features include a private central atrium that opens to the sky and a 600 sq ft showcase garage with high ceilings and room for a car lift. Two private rooftop terraces totaling 1,100+ SF with sweeping views of The Hollywood Sign, Griffith Observatory and Downtown LA plus a private back yard on the ground level. Located in Larchmont Village with charming neighborhood shops and cafes and only minutes to celebrated Hollywood hangouts and countless fine dining and entertainment options, Paramount Studios and the 101." "Gorgeous Traditional in Hancock Park Proper, 3 bedrooms with 2 full baths upstairs, powder room down. Center hall floor plan with sweeping staircase, light and bright entertainers living room, formal dining room, sleek updated eat-in kitchen with marble counters, farm style sink and vintage stove. Spacious den with fireplace and generous closet (so could be 4th bedroom). Cozy garden room overlooking backyard plus 2 bonus rooms up! Master bedroom with luxury bath & tremendous walk-in closet with vanity. Hardwood floors, fresh paint inside and out! Lush yard, two car garage, A/C, 3rd Street School, HPOZ." "PRICE CHOP! MOTIVATED SELLER!Developers dream project! Located one house away from the Larchmont strip this is a once in lifetime opportunity. Approved plans to build 4227' 7/6.5 STUNNING Spanish home with a pool, ADU, firepit, BBQ area, basement studio - the whole enchilada. Designed by renowned Architect William Hefner the home maintains historic features while incorporating all modern amenities. This is an unbeatable house in an unbeatable location. Death in the family forces the sale. Existing house is 4/2. Includes HPOZ approval, all plans, permits, reports. necessary to start construction. Shovel ready!" "BY APPOINTMENT ONLY. Major top to bottom remodel in mid-2000's. No expense spared! Nestled on S/E corner of 1st & Lucerne - mere feet from popular Larchmont shopping and dining. Restored and updated throughout! 4 bed/ 2.5 new baths in the main house + 2 story pool house with bath, kitchen, and two rooms upstairs. Open plan entry/ dining/ gourmet kitchen - great for entertaining. Dining area and formal living room both with vaulted ceilings and exquisite wedding cake molding. Amazing backyard with pool and swim up bar, raised spa and built-in BBQ. Two car garage enters from 1st Street. Security & A/C. 3rd Street School. Windsor Square HPOZ." "Situated in the architecturally distinct neighborhood of Larchmont Height, sits this stunning modern luxury on a beautiful residential street. The ultra-sleek 14 ft waterfall Soapstone Island with breakfast grill and bright white cabinets imported from Spain adorn the chef inspired kitchen. Master en-suite features sliding doors that generate an abundance of natural light, paired with Italian porcelain tiles and full-sized tub to decorate the bath. Step out onto the resort inspired backyard with pool and entertainment deck ideally set for a fire pit and grill. Opulent design elements envelop every corner of the home with white oak engineered hardwood floors throughout and hip salvaged lumber and black stone fireplace. New windows, doors, roofing and electrical. Enjoy evenings in Larchmont Village's quaint shopping area or dine at some of LA's top-rated restaurants. Convenient to local grocers, restaurants, shopping, cafes and minutes from Paramount Studios & Wilshire Country Club." "This is your chance to live in a Historic Landmark in Hancock Park & built by legendary Architect Leland Bryant in 1926. Country Club Manor is an exclusive, luxury full-service building & celebrity enclave. The building features 24-Hr security, doorman, onsite manager, staff & 24-hr valet parking. Other features include a gym, extra storage, onsite laundry, manicured landscaped grounds & sumptuous lobby that highlights the buildings 1920's details. Unit 100 is a rare & coveted front facing ground floor with approx. 1,600 sq.ft. It features beautiful views of lush & landscaped gardens. With 3 bedrooms & 2 baths, high ceilings, hardwood floors & crown molding. The kitchen has high-end stainless-steel appliances, a Sub-Zero refrigerator, SS cook top, microwave, ovens & dishwasher. Across from the exclusive Wilshire Country Club & Golf Course & around the corner from trendy Larchmont Village. In one of the most desirable neighborhoods and an easy commute to Downtown LA or Beverly Hills."